Container Gardening and free classes with Craftys! I've always wanted to have my own farm with tons of gardening beds to grow enough fruits and vegetables to feed my family for the entire year! Living on a farm and having enough acreage to have a garden of that size is not very easy or financial realistic living in the suburbs of Chicago. Unless, you want to drive far outside the area to afford something like this. We were blessed to purchase a home that has an amazing backyard. To be honest, the deciding factor in our home search was the yard. We're outdoorsy people and need a space where we could really do what we want. With that being said, I need to be methodically and inventive with how I plan my garden this year. While it would be amazing to fill the entire backyard with raised garden beds that wouldn't be fair to the kids or the hubby. So instead I am looking more into container gardening and utilizing our amazing and rather large deck as a place to layout my plans. Craftsy offers this free PDF on container gardening. This is a great resource to get started. Not only does it give you a crash course on container gardening, it also educates you on the best plants for this type of option. My favorite part was the recipe on how to make your own potting soil! Container gardening is a great option for anyone who is limited on space such as an urban garden. 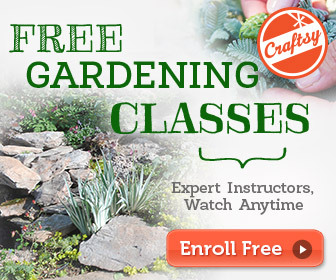 Craftsy also offers free online gardening classes! Make sure to check out their website because it doesn't just stop at gardening! They offer a wide selection of online courses from embroidery to woodworking or paper crafts! Would you like to see more of the free resources that Craftsy has to offer? I would be happy to share some more with you! Please share the area you are most interested in! Posted on April 17, 2015 by Katie De La and filed under Home and tagged Crafts container gardening craftsy gardening with kids gardening home and garden home garden urban farming.